Is 1xBET a Scam or Legit? Read 24 Reviews! Deposit: Credit/Debit Cards, E-Wallets, Cryptocurrencies, etc. One of the things that we’ve seen over and over again is the problems that occur when a sport betting site decides to jump on the band wagon of lotteries. I was looking into the online lottery site 1xBET.com and got totally lost. The first thing that hit me was the amount they showed as the jackpot. Really strange considering we all know that mega lotteries like US Powerball and EuroMillions have minimum start amounts. Then again this is a betting site, hence maybe what they payout isn’t quite the same as the published amount. Let’s go see. 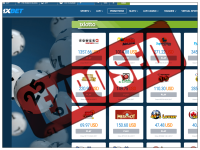 1xBET.com offers players the opportunity to bet on 33 international lotteries. In some cases, you are playing against the real full ticket line drawn on the official sites they represent. In some cases, you have the opportunity to choose say 5 numbers (when a lottery actually draws 6). Only some of the lotteries seem to include the bonus ball – like US Powerball – though there is something in their terms and conditions that says bonus balls are not played. More on the T&C shortly. Winnings are credited direct to your account after any lottery draw and paid to you upon request the same way you put money in. There is no information on whether they take a commission or any fees that are charged to get your winnings. Well, they do say that there are no charges if you’re using bitcoins. In their betting information, there is a heap of information on selling your bet or a part of it back plus insurance. But we’re not sure if this applies to lotteries or only on their other betting available. Don’t expect any further clarity at 1xbet.com in their terms and conditions. There are two sections there that deal with lotteries and the information is very limited. They do say that you own the ticket line that you picked and you get your winnings. But the T&C refers to “symbols” versus numbers and put more space into what happens if your ticket is defective versus what happens when you play here. Asking questions direct to this online lottery betting site, their live chat is open 24/7. The only problem is, no one seems to understand how the lottery side of this site works. I tried several times to get an answer regarding the difference between what is the published amount of an official lottery jackpot versus the amount that they publish and no one could give me straight answer. Their final line was “that’s all the information we have available”. Sorry folks, not good enough for me. There is a UK phone number though it’s pretty obvious that’s not where their customer service is located. 1xBET.com is owned by Exinvest Limited, a company based in Cyprus. They offer the phone number, an email address and live chat for asking questions. Just don’t expect an answer. For lotteries, make sure you stay with the site link of 1xBET.com/en/lotto otherwise you’ll be weeding your way through a whole heap of sports betting. That’s the problem here. The site focuses on betting on all kinds of different sporting events and it looks like they added lotteries as an afterthought. This site gets a thumb’s down. It’s great that they have 24/7 live chat customer service available but it would be good if someone actually understood how their betting on their lotteries worked. If anyone is playing here, please give us feedback. Make sure you do the KYC process perfectly. 1xbet is the BEST bookie what I have tried, very good odds and it fits perfectly to my needs as a high roller. 1xbet doesn’t limit your stakes. 1xbet have biggest limits and super fast and smooth withdrawals. Hope every other bookie would take a look at how 1xbet handles this business. 1xbet is the worse betting site. They don’t pay, they don’t respect their own Terms and Conditions. They will fool you around with their ridiculous account verification process. In the end, you will only loose your time and nervs and never get your money paid. Remember, Google every site before making a deposit. Those scumbags are like cancer, all over the Internet. Stay away from everything that is linked with 1xBet or their other brands. I wish them all the worst. This review is 100% accurate. Checked out site only after I kept seeing multiple “commercials” with “promo codes” on (pirated) DVD’s that I purchased. Site is very much too good to be true and an absolute scam. You may win money on the site but you will never receive any of it. Please stay away from this site, I was forced to give this a 1-star rating because it doesn’t allow you to give zero. So i am a victim of this website as well. Unbelievable how they can fool people who are winning something. I actually have an account already for about 2 years I think and I am verified all this time. There were many small issues everytime with withdrawing, but 2 days ago I made from 100 to 1250eur in 1 day and they completely block my withdrawal!! I can’t touch my money, can’t place any bets I’m completely blocked for no reason. I’m an honest fair player, don’t follow tipsters, just bet inplay myself always. Now I get the most weird questions like others always get. They steal my money. This has to be stopped!!! Fake. Stay clear!!! NO LEGITIMATE COMPANY is ABLE TO ADVERTISE ON PIRATE MOVIES. If you give them any of your money then more fool you. I’m a genuine victim too. Cannot withdraw cos they give reason “specialist” looking into it but I doubt to get my withdrawal after seeing so many complaints at different sites. I deposited USD 100 and I played and won more USD 50 and then I thought to check the withdrawing system. I am unable to withdraw!!! They are real scammers they took my funds many times from me and when you asked them they said their best specialist is working. Later few days there will tell you that their systems are working perfectly well. My funds always disappear many times even when you are not placing bet. STAY AWAY from this crap company! Their customer service is lousy and whenever they can bend the rules to steal your money, they will do it. As an example: I placed a bet at the halftime break, in a basketball match 🏀 HALF TIME BREAK … long before the 3rd quarter even started ….. but then because apparently there was some scoreboard/timeissue during the 3rd quarter (DURING the 3rd quarter) then they void the bet. And I could mention at least 10 other similar or even worse examples. And the customer service is the most arrogant and stupid that I have ever experienced anywhere. Tried to call them, and talked to this (no offense, but honestly) stupid woman who could hardly speak English and who was just repeating the same arrogant robotic answers. It shows they are located in Russia. Mafia is in it, indeed. They stole my 3k by placing a bet on a game I never staked on. A tennis inplay match was used to wipe the money in my account. The bet wasn’t in my bet history. I sent them my screenshot. They later added the bet to my history. A bet placed around 9 pm when I was driving and never had my phone with me. Simply scam. Easy to deposit, but you can’t withdraw. Worst website i have ever seen, stay away, stay away, stay away. Very bad user experience, very slow website. I couldn’t withdraw money, they always give an excuse. I bet on live with 20 euro, they took 100 euro. I think it is administrated by beginners or thieves. I’ve recently played with 1xbet and made a deposit on 25 Feb 2018 for the amount of MYR200 (100 * 2). After playing on their Live Casino (Authentic Gaming), I noticed that my balance is actually going down even when I was winning. So I made a final test of USD0.50 bet and won but my balance went down by USD0.50 instead of going up. I have contacted their support team multiple times about this but their reply each time was that they’ll send it to their specialist. After that, they finally told me that nothing was wrong with their system and my money magically disappear. I’ve asked them to show me how much I lost and how my balance manage to become 0.00 but they can’t show me each time. This is their latest tactic in cheating their customers and taking their money without them noticing. Hope people will be about this and not lead people into having their money taken without a reason. I’m more than happy to show my records I’d your need it. I joined 1xbet in November, deposited a couple of £100 and eventually made a profit. Made a request for withdrawal and ok, a couple days later, get a message saying successful and verified by the operator. Wow, these are good (so I thought). So carry on depositing and withdraw when in profit. I have successful withdrawals to about £4000 and deposits to about £3000. Shock horror when statement comes, all deposits, but no payments. Contacted their live chat, may as talked to the wall (useless). Sent email explaining my situation. NO reply (yet) eternal optimist.